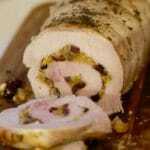 The title of this recipe, Apricot Cranberry Stuffed Pork Loin Roast, doesn’t really do it justice. 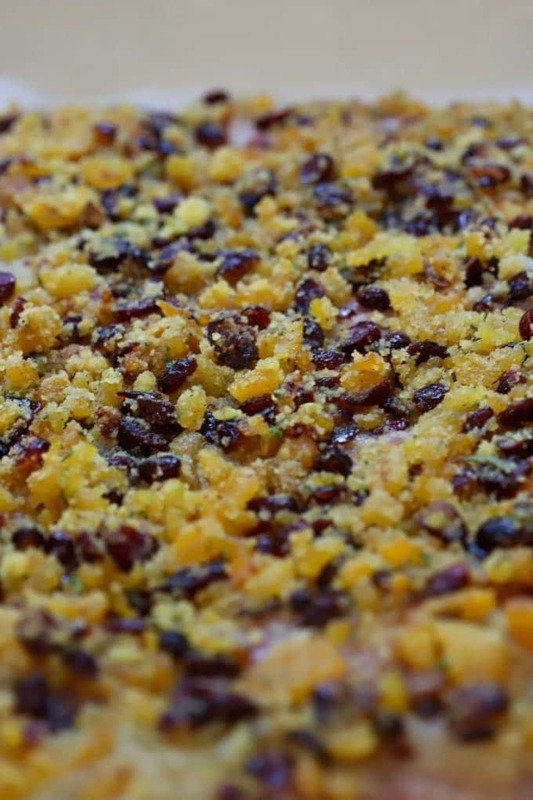 Yes, the pork loin roast is full of luscious apricots and tart cranberries, but there are so many more delicious ingredients in the stuffing, including cornbread, applesauce, garlic, shallots, celery, sage, thyme, and rosemary. 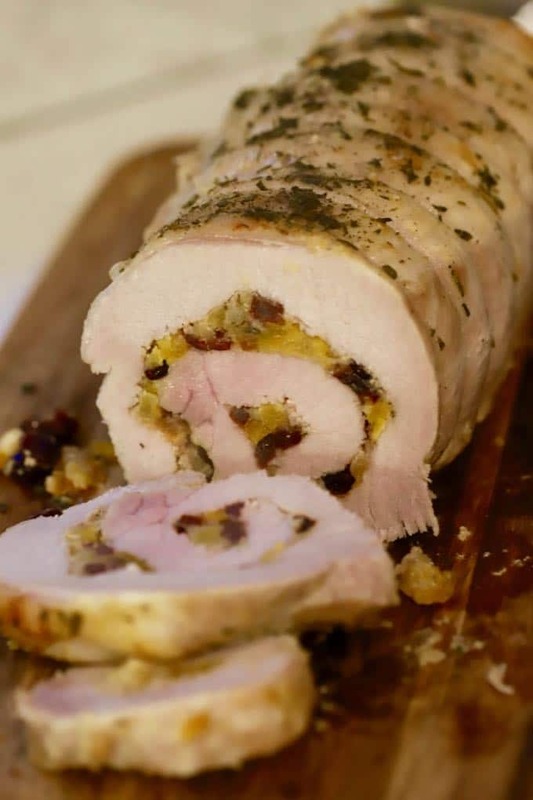 But wait, there is even more deliciousness in this Apricot Cranberry Stuffed Pork Loin Roast recipe. I couldn’t leave well enough alone and included a mind-blowing Apricot Wine Sauce to drizzle over the top of the succulent pork loin roast. I know this pork recipe may look complicated and there are a lot of ingredients, but trust me, you can do this! Just follow my easy step-by-step instructions! And, as a bonus, you can make most of it ahead of time and then just pop it in the oven before your company arrives! 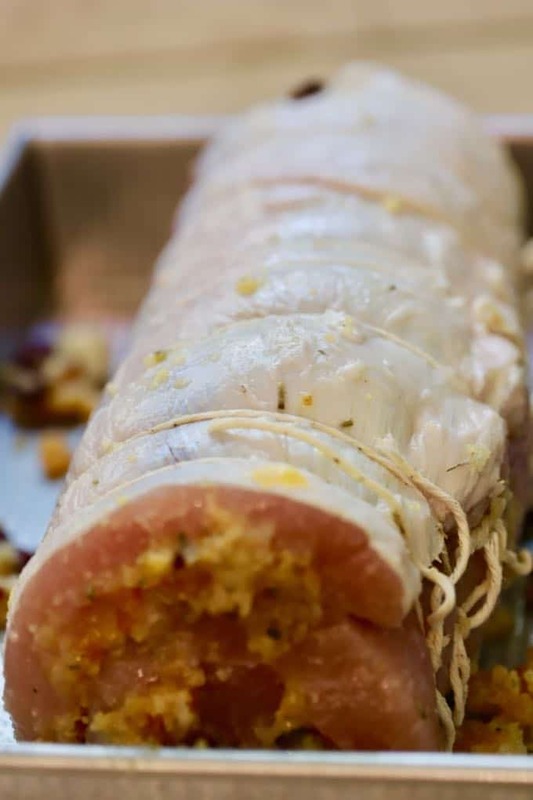 Apricot Cranberry Stuffed Pork Loin Roast isn’t an entree for a casual weeknight dinner, but it is an elegant and flavor-packed dish for a special dinner party or holiday dinner. Believe it or not, the holidays will be here before you know it, and if you are looking for an alternative to traditional turkey, Apricot Cranberry Stuffed Pork Loin Roast with Apricot Wine Sauce would make a scrumptious show-stopping entree for your Thanksgiving or Christmas dinner. Because pork loin roasts can be a little dry, I first brined it in a pork brine of water, salt, and brown sugar to ensure it was juicy and delicious. I then butterflied the roast, stuffed it with the sweet and savory apricot stuffing, and rolled it up jellyroll style. Finally, I tied it up just like a present, to make sure it cooked evenly, and the stuffing didn’t fall out. This dish was inspired by a recipe for Fruit Stuffed Pork Loin Roast with Peach Glaze, by my friend Kristy Murray on her blog, Linger. I met Kristy at a photography workshop in Minneapolis last November and the minute I saw her recipe, I knew I had to make it. I first made the recipe as is, then put my own spin on it by brining the pork first, changing up the stuffing a bit, and then adding the decadent apricot wine sauce. What’s the difference in pork loin and pork tenderloin? 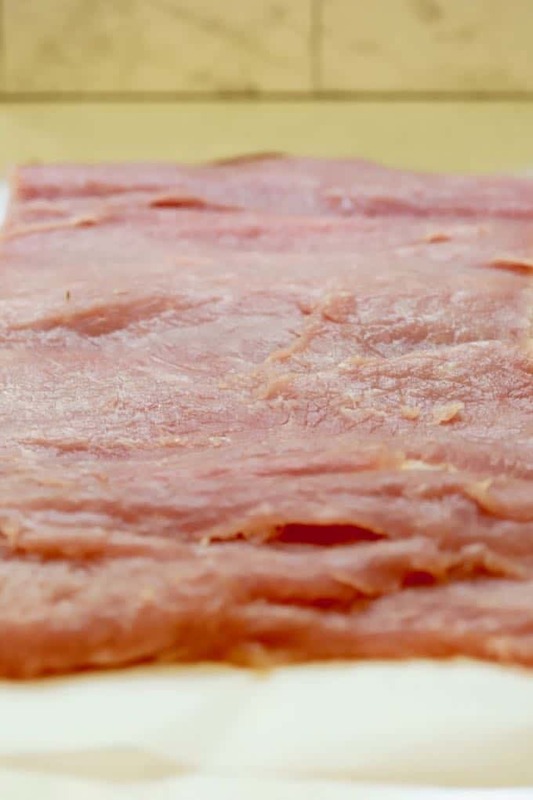 Although they sound alike and are often confused, pork tenderloins and pork loins are two very different cuts of pork, from different parts of a pig, and are cooked quite differently. Pork loins are larger and very lean; they have to be cooked low and slow to keep them from drying out. Pork tenderloins, on the other hand, are smaller and more tender, while also lean, they can be cooked at much higher temperatures and for a shorter amount of time. 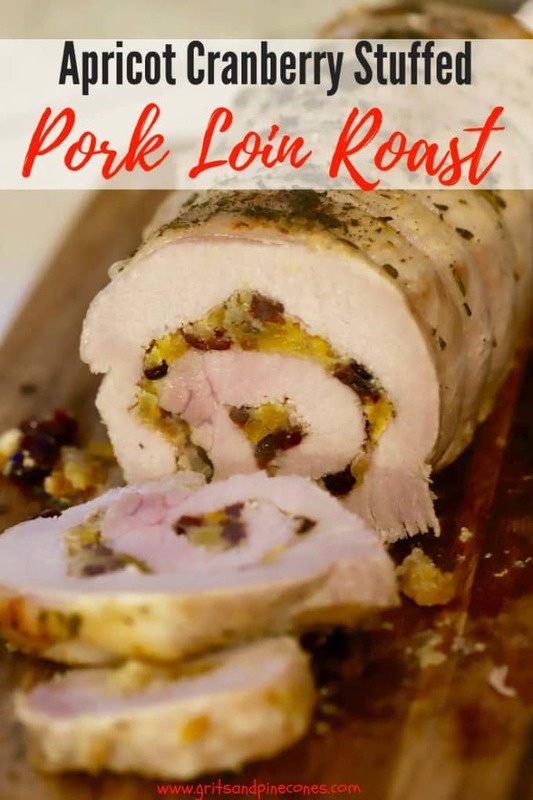 In general, because of the cooking heat and time differences, you shouldn’t substitute pork loin for pork tenderloin, or vice versa, in recipes. 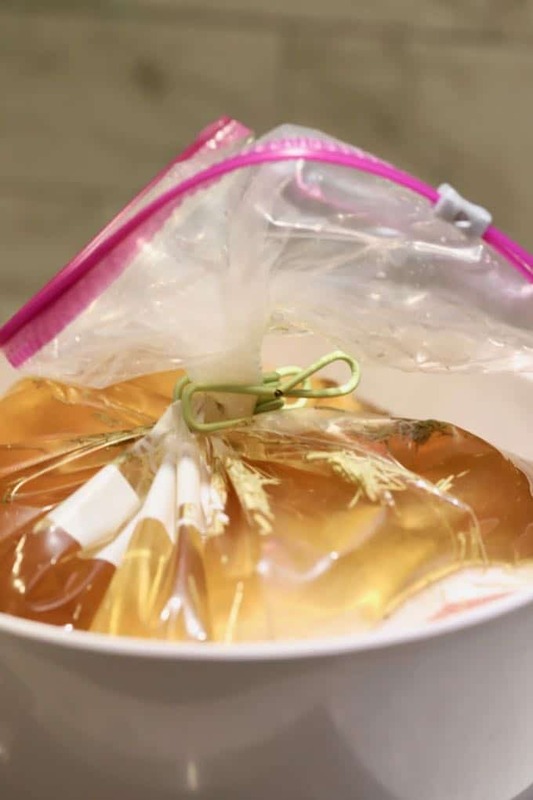 How to brine a pork loin and can you brine too long? First things first; yes, it is possible to brine pork for too long, which will result in salty meat. A whole pork loin roast can be safely brined for up to 24 hours. 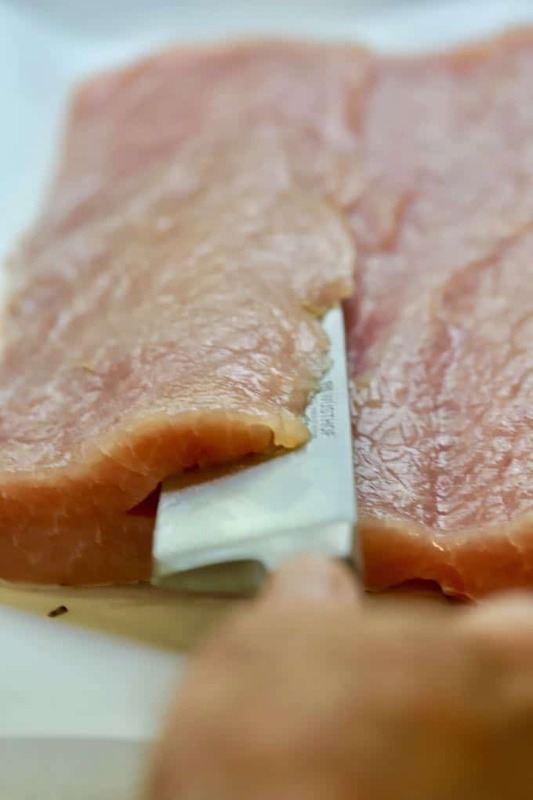 Smaller cuts of pork, such as pork chops or pork tenderloin, will take much less time. 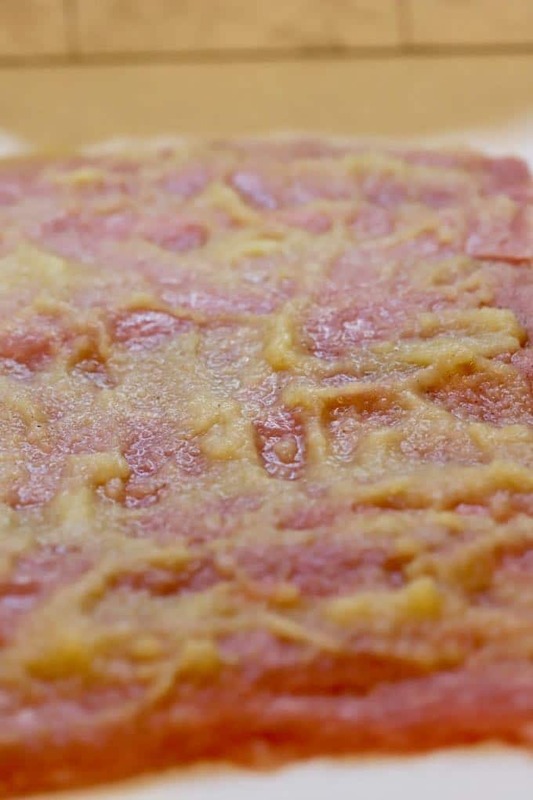 Brines work by breaking down the tissue and drawing in moisture to make the meat more flavorful and juicy. To brine a pork loin, simply mix salt and brown sugar, with water, add the pork and refrigerate. The basic recipe is 1/2 cup each of kosher salt and brown sugar to 2 quarts of water. You can add other herbs and aromatics, but I like to keep it simple. Be sure to rinse your pork loin well to remove the brine solution and discard the brine. At this point, the pork can be covered and refrigerated until you are ready to use it in a recipe. To butterfly the pork loin roast, place the roast (fat side up) on a cutting board topped with a sheet of heavy-duty plastic wrap or parchment paper. With a sharp knife, start at the middle on the long side of the loin and slice the pork loin in half, lengthwise, stopping about 1/2 inch from the other edge. Open the pork loin like a book. Then with the knife perpendicular to the cutting board and the knife blade edge facing left, start slicing at the bottom of the first cut on the left half, and slice horizontally, cutting the left side in half again, stopping about 1/2 inch from the edge. Open the left half like a book. Next, with the knife perpendicular to the cutting board and the knife blade edge facing right, start slicing at the bottom of the first cut on the right half, and slice horizontally, cutting the right side in half again, stopping about 1/2 inch from the edge. Open the right half like a book. You should have a long rectangular piece of pork when finished. 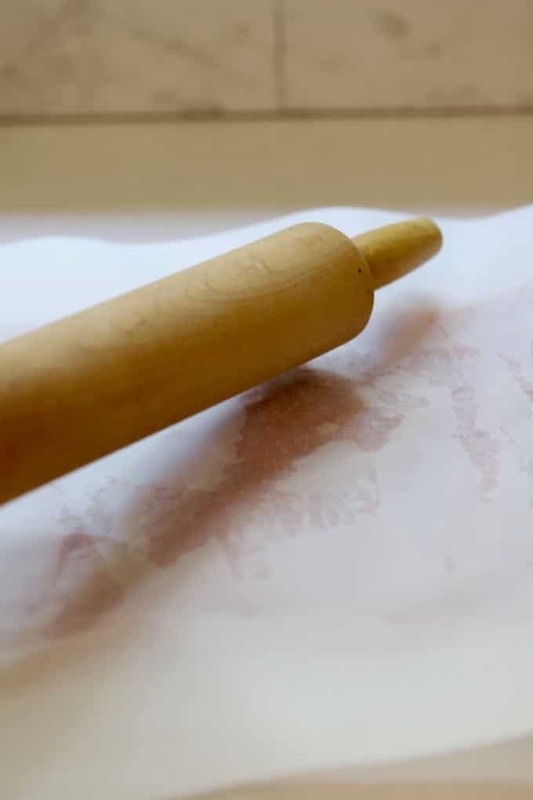 Cover the pork loin with a piece of heavy-duty plastic wrap or parchment paper, and use a rolling pin or meat mallet to gently pound the pork until it is all uniformly about 1/2 inch thick. Butterflying can be a little tricky so if you still need help, check out this YouTube video on how to butterfly a pork loin roast. You can also ask your butcher to butterfly the pork loin for you. However, if you do have the butcher butterfly the roast first, be sure to reduce the total brining time to just 12 hours tops, because you will have more of the pork surface exposed! 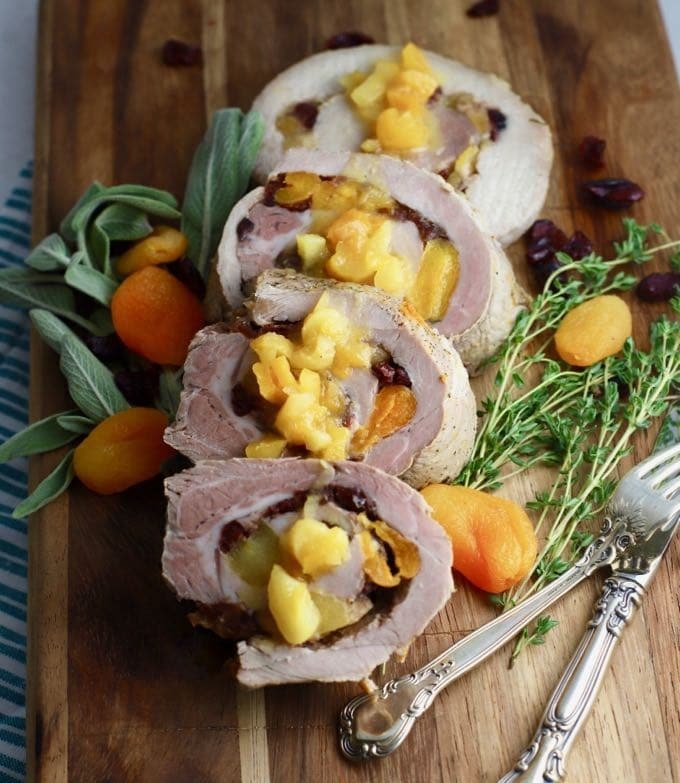 What to serve with Apricot Cranberry Stuffed Pork Loin Roast with Apricot Wine Sauce? I served this delicious Pork Loin Roast at a Supper Club dinner party recently and it paired beautifully with side dishes Brussel Sprouts Gratin and Cauliflower Puree with Thyme. Of course, I think it would be equally delicious with my Ultimate Broccoli Cheese Casserole, Make Ahead Mashed Potatoes, Southern Sweet Onion Casserole, or Easy Spicy Southern Corn Casserole! How to make Apricot Cranberry Pork Loin Roast and Apricot Wine Sauce. To make the stuffing for the roast, first, preheat the oven to 325 degrees F.
Melt the butter in a large skillet over medium heat. Add the shallots and celery. Cook, stirring occasionally for about 4 minutes until the vegetables are tender. Add the garlic and cook for about 30 seconds. Add the apricots and cranberries. 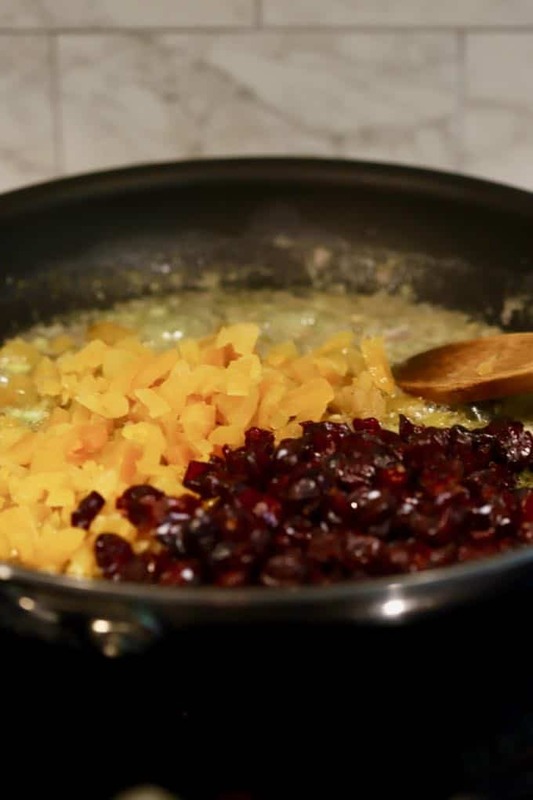 Cook for about 3 minutes to allow the fruit to plump up. 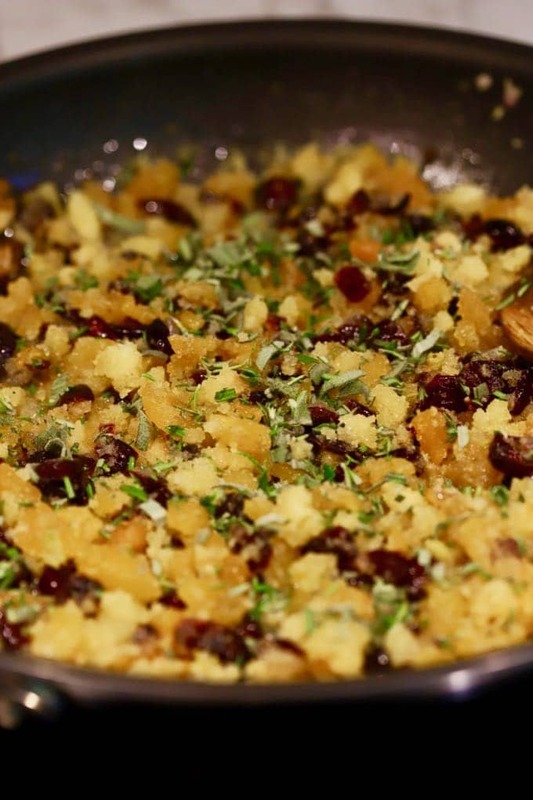 Add the crumbled corn muffins and 1/2 of the fresh herbs and set aside. Butterfly the pork loin roast. 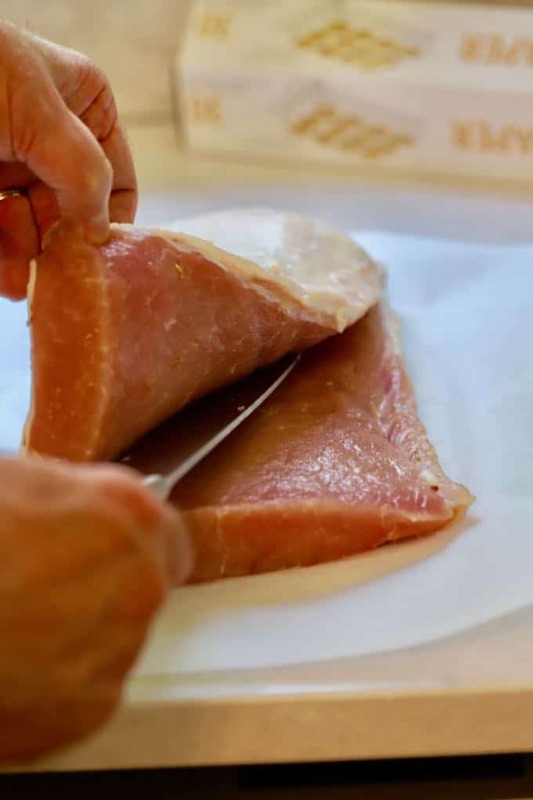 Cover the butterflied pork loin with a piece of heavy-duty plastic wrap or parchment paper, and use a rolling pin or meat mallet to gently pound the pork until it is all uniformly about 1/2 inch thick. Sprinkle 1 teaspoon salt and 1/2 teaspoon of pepper evenly over the pork. Mix the applesauce and cinnamon together and use a spatula to spread it evenly over the pork, leaving about 1/2 inch on all sides. Add the stuffing mix and spread it evenly over the applesauce. Again, leave about 1/2 inch on all sides. Start at the short end and roll the pork up as tightly as possible jellyroll style. Cut 6 pieces of kitchen string about 12-inches long and tie the roast together tightly about every inch. Spray a baking pan with non-stick cooking spray and place the roast, fat side up in the pan. Brush the top of the roast with olive oil, season with remaining salt and pepper, and sprinkle the remaining herbs over the top. Add the wine to the bottom of the pan. Cover the pan tightly with a lid or aluminum foil and cook for 1 hour. After an hour, remove the roast from the oven and uncover it. Continue cooking uncovered for another 15-20 minutes, or until an instant-read meat thermometer inserted in the thickest part of the roast reads 135 degrees F.
While the pork loin roast is cooking, make the Apricot Wine Sauce by adding olive oil to a small saucepan over medium heat. When the oil is hot, add the shallot and sprigs of thyme and cook for about 4 minutes, until the shallots are tender. Add the wine and boil for about 4 minutes or until the wine is reduced by half. Once the sauce thickens, add the butter and stir until it is melted. To serve the roast, use a sharp knife or an electric knife and slice the roast into 1/2 inch slices. Top with the apricot wine sauce, or put the sauce in a small pitcher or gravy dish and serve it on the side. 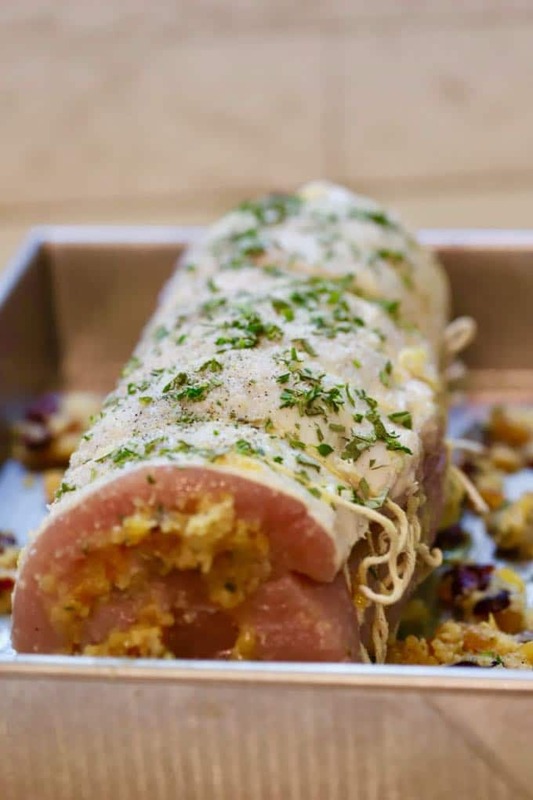 Apricot Cranberry Stuffed Pork Loin Roast is full of luscious apricots and tart cranberries, cornbread, applesauce, garlic, shallots, celery, sage, thyme, and rosemary. To serve, use a sharp knife or an electric knife and slice the roast into 1/2 inch slices. Top with the apricot wine sauce, or put the sauce in a small pitcher or gravy dish and serve it on the side. What's the difference in a pork loin roast and a pork tenderloin? 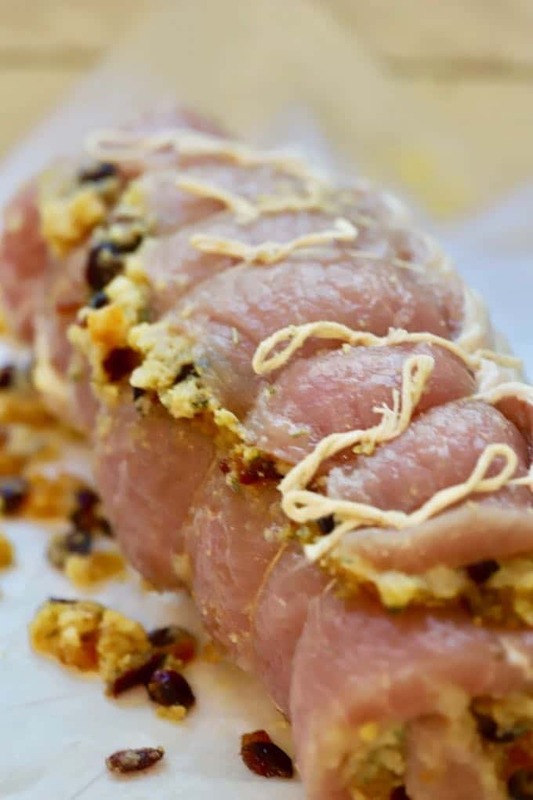 In general, because of the cooking heat and time differences, you shouldn't substitute pork loin for pork tenderloin, or vice versa, in recipes. Next, with the knife perpendicular to the cutting board and the knife blade edge facing right, start slicing at the bottom of the first cut on the right half, and slice horizontally, cutting the right side in half again, stopping about 1/2 inch from the edge. Open the right half like a book. You should have a long rectangular piece of pork when finished.Butterflying can be a little tricky so if you still need help, check out this YouTube video on how to butterfly a pork loin roast. You can also ask your butcher to butterfly the pork loin for you. However, if you do have the butcher butterfly the roast first, be sure to reduce the total brining time to just 12 hours tops, because you will have more of the pork surface exposed! Sharon, thank you so much for linking to my recipe!! I absolutely love the variations you made to the recipe. The apricot wine sauce sounds fabulous! Now I’m gonna have to try your recipe. I love all your process shots and how detailed you were each step. Your site has fantastic recipes and I always find it to be such a good resource. Thank you so much for your sweet comments! I love your recipe and can’t wait to make it again!